This overt aggression and rising nationalism are a cause for concern and it would indeed be irresponsible of our government and the security establishment if we were not to take into consideration all the ramifications it may have and initiate suitable action to protect our sovereignty. Towards this end a more realistic appraisal of the capabilities of our armed forces and the initiation of necessary corrective action to close the gap is an inescapable necessity. However, to look to the future, we certainly need to look learn from the past. 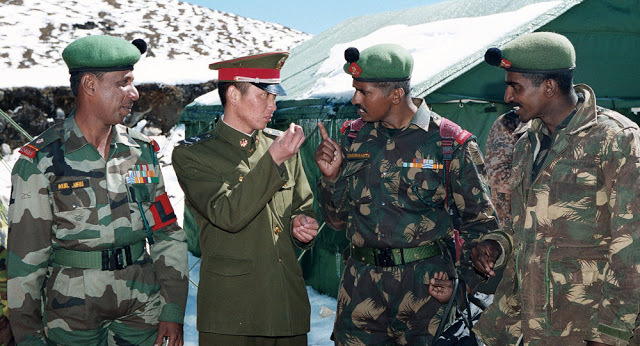 After the initial action initiated to remedy the situation under the able leadership of Y.B Chavan, the then Defence Minister, there was little substantive effort to ensure we continued to maintain both the necessary dissuasive capacity to confront the People’s Liberation Army (PLA) or the necessary intellectual and institutional efforts required to ensure successive generations of leaders learnt the important strategic or tactical lessons that emerged from the campaign. Our inability to place the Henderson Brooks Report in public domain is a clear indication of our attitude of preferring to bury our heads in the sand in the fond hope that the problem would disappear. As we have repeatedly learnt to our cost, this invariably never happens and problems tend to only increase in complexity and size over time. The opening skirmish of the Sino-Indian conflict of 1962 occurred in the North East and was the attack on September 08, on the isolated Assam Rifles post at Dhola, on the southern slopes of the Thag La ridgeline that was dominated by positions held by the PLA, its loss, a foregone conclusion. However, the more serious business of war commenced at approximately 0500 hours on October 20, 1962, when the PLA commenced its artillery barrage in support of its infantry attack against 7 Infantry Brigade positions along the Southern banks of River Namka Chu. The battalions of the Brigade were deployed in platoons over a 20-km frontage with little mutual support in temporary positions with no overhead cover. At that time, neither Brigade Headquarters nor any of its higher headquarters was aware of the force level that opposed them. By 0900 hours, the Brigade ceased to exist as a fighting force and within just another ninety six hours, Tawang, a strategic border town approximately 100 km in depth, held by an under-strength battalion, was attacked and captured without a fight. Almost simultaneously, in the North, isolated forward positions in Aksai Chin and the Pangang Tso area were also cleared after brief skirmishs. After an administrative pause of approximately a month, the PLA launched the next phase of its offensive with assault on Walong on November 16, and on the main defences of 4 Infantry Division at Bomdi La, Se La and on the Division Headquarters at Dirang Dzong. Simultaneously on November 20, Chushul came under attack by an Infantry Division. The reverses in the conflict came to be regarded as a stunning and comprehensive national defeat despite the fact that only a very small fraction of either army actually saw combat. The reverberations of that defeat left an indelible stain on the reputation of Pandit Nehru, who is reported to have subsequently died a deeply dejected man. It also resulted in the sacking of Krishna Menon, the Defence Minister, O Pulla Reddy, the Defence Secretary (of whom Krishna Menon used to disparagingly say “he has neither pull nor is he ever ready”2), General P.N Thapar and some other senior officers. Surprisingly, some others, who were certainly guilty of unprofessional conduct such as Brigadier D.K Palit, the Director – Military Operations, ended up being promoted. Incidentally, Brigadier Palit spared no efforts to hamper subsequent investigations of the Henderson Brooks Committee that was set up on the orders of the new Chief of Army Staff, General J.N Choudhury. More than half a century later when we again face a seemingly assertive China, it may be worth pondering if we have imbibed any of the lessons from the earlier debacle. In the Official History of the 1962 Conflict with China, the Chief Editor, Dr S.N Prasad, comes to the interesting conclusion that the chief reason for our defeat was that the political establishment was unable to avoid a war while it was in the process of transforming the military establishment. He believes Pandit Nehru and Krishna Menon saw the military as, “a close-knit professional body, deliberately isolated from the citizen. Its predominant motive force remained espirit de corps and not identification with the people. Someday it may even act like the Praetorian Guard of the Roman Empire. The Indian Army trained and fought like the British Army, unimaginative, elephantine, rule-bound and road-bound… Perhaps he wanted to model it after the PLA, more egalitarian, flexible and closer to the people…Such basic changes required a committed or at least a pliant, band of army officers in key positions. So mediocre Thapar was selected instead of the doughty Thorat as Army Chief and Bijji Kaul was made CGS…To carry out this transformation of national defence set up, a decade of peace was absolutely essential. For establishing indigenous weapons manufacture, money had to be found by cutting arms imports. The armed forces would be short of equipment and stores for several years till the new arms factories started producing. The officer cadre was a house divided till the new breed fully took over. Prasad is certainly partially correct in his observations, especially regarding the insecurity and the unfounded fears of the political establishment of the forces staging a coup that led to it being “outsourced” to the civilian bureaucracy to control, which continues to be followed even to this day. It can also be argued that the retention of the British Indian Army with its ethos and traditions was a deliberate choice that Nehru and the political leadership made at Independence, based on their self-interest. He had the choice of remodeling it on the lines of the Azad Hind Fauj, an army that was certainly nationalistic, egalitarian and close to the people. At the very least, he could have retained the services of those who had experience in senior ranks, as Pakistan went on to do, and had commanded INA Divisions and Brigades, Training Establishments, Intelligence Establishments and the administrative and logistic services, experience that Indian officers of the British Indian Army sorely lacked. That Pandit Nehru did not do so on the advice of Mountbatten and preferred to permit British officers to continue holding senior ranks is another matter. As per him it was Nehru who initiated action to enhance equipment profile and capabilities of our armed forces by increasing the defence budget from US$2 billion in 1950 to US$4 billion in 19606 and the armed forces strength from 2.8 lakh in 1949-1950 to 5.5 lakh in 19627. While Nehru may have been cognizant of the Chinese threat as early as 1951, he certainly did not take it seriously. The very fact that he and the Defence Minister chose to be out of the country in September 1962 and that his orders for dealing with the Chinese incursions were conveyed to the Army Chief by a Joint Secretary in the Ministry of Defence certainly bear this out. The two other critical issues that adversely impacted during this period were intelligence failure and adoption of the so-called “Forward Policy”, which as per some commentators, showed India’s aggressive intent and is certainly held to have been instrumental in provoking the Chinese, leading to the subsequent conflict9. Subrahmanyam’s take on the issue is certainly interesting and at odds with what general perceptions would have us believe. The crux of his argument is that the Joint Intelligence Committee (JIC), which at that time a sub-committee of the Chiefs of Staff Committee, was non-functional and all intelligence reports received from the Intelligence Bureau were never assessed. In fact, he believes that this was a grave failure of the bureaucracy, both civil and military, as they did not understand the essential difference between intelligence reports, which pertain to current issues, and intelligence assessments that also suggest future scenarios. With regard to the controversial “Forward Policy”, Subrahmanyam makes two very simple arguments. Firstly that with the Chinese constantly shifting their claim lines and moving troops forward, the Government of India had little choice but to push towards its own claim line and establish its presence there. He does not touch on the fact that some of the positions occupied by us were North of our claim line, such as the one at Dhola. He also goes on to point out that during discussions on the “Forward Policy” both the External Affairs and the Defence Ministries erred in asking B.N Mullik, Director Intelligence Bureau, to prepare an assessment of the likely Chinese course of action instead of having the JIC prepare such an assessment, disregarding an elementary principle of intelligence assessment that the intelligence gathering agency must never be asked to assess its own information. Another critical aspect that was certainly responsible for the debacle was the issue of border infrastructure. There was an absence of suitable roads, permanent telephone lines, forward airfields and staging areas. Consequently, troops were forced to march for days with only what they could carry with little hope of replenishment. Artillery support was, therefore, non-existent, communications were rudimentary and there was little scope for moving reserves to the point of decision, the fundamental requirement for any defensive battle. Some attempts were made to take corrective action by 1959, but the time available was certainly not enough to meet all critical infrastructure needs. While the failure to construct roads and other administrative, logistic and communication infrastructures and even permanent defences could certainly be blamed on lack of political involvement or will and bureaucratic bungling, it may be worth recalling that the primary reason for this was the concept of battle that the military leadership had advocated. It had been visualised that lack of infrastructure would force the PLA to develop axes required for supporting their offensive. Given the difficulty in road construction in mountains, not only would the PLA have great difficulty in progressing operations, but such activity would give away their offensive thrust lines and force levels. Unfortunately, poor operational and tactical planning along with poor leadership at the operational levels resulted in what should have been a well conducted defensive operation turning into a rout.